With all the recent winter images from the southern hemisphere here for balance also a view from the north of the west coast of Greenland. 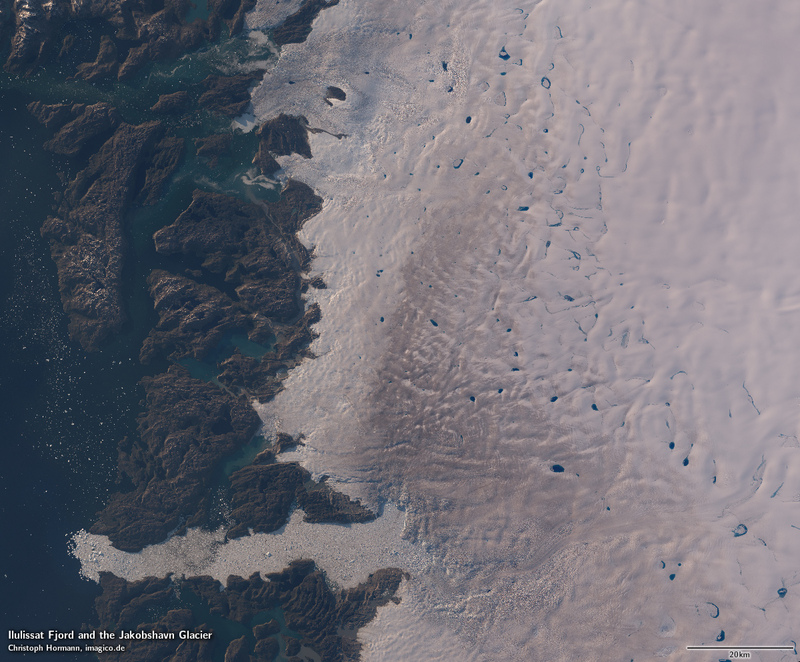 It shows the Ilulissat Fjord at the bottom, one of the most remarkable features of the Greenland coast. This fjord is filled with icebergs and smaller fragments of glacier ice all year round generated by the Jakobshavn Glacier. This glacier produces a large portion of the icebergs traveling south in the Baffin Bay carried by the Labrador Current towards Newfoundland and the North Atlantic Ocean. On the right side of the image you can see the western edge of the Greenland ice sheet. The dark streaks on the ice near the front of the glacier are dust deposited on the ice that have accumulated on the ice surface through melting. You can also see various dark blue melting ponds on the ice in this area and further east. The front of the glacier you can see in the following magnified crop has receded significantly during the last decades. 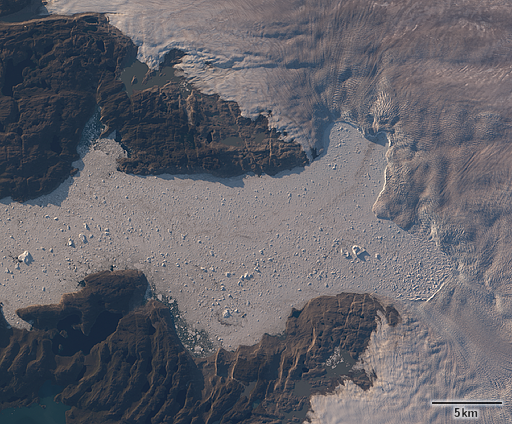 The icebergs produced by the Jakobshavn Glacier can reach sizes of up to a kilometer and frequently stay grounded in the fjord for longer times. They do not however reach the sizes occasionally generated by the Greenland glaciers further north like the Humboldt- and Petermann glaciers. The images are based on a late evening Landsat scene from July 19.